Conference of Presidents calls for more comprehensive deal with Iran. National Conference on Jewish Affairs welcomes Trump's announcement. 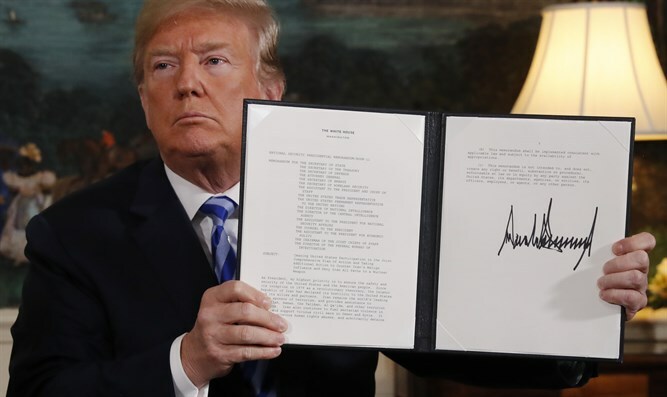 Stephen M. Greenberg, Chairman and Malcolm Hoenlein, Executive Vice Chairman/CEO of the Conference of Presidents of Major American Jewish Organizations responded on Tuesday to President Donald Trump’s decision to withdraw from the Iranian nuclear deal. "The President’s declaration reflects frustration with Iranian behavior following the implementation of the JCPOA. While there are some differences of views as to the most effective approach, the Conference of Presidents has clearly and consistently called for an agreement which would ensure that Iran never obtains a nuclear weapons capability that would augment its ability to create mayhem in the region through its support of terrorism," they said. "Today’s announcement, we hope, will create an opportunity to accomplish these goals. We hope that a more comprehensive arrangement with stricter compliance rules, a prohibition against the development of long and short-range ballistic missiles, any weaponization program, and, of course, human rights violations, will become a reality. Sanctions targeting banking and energy sectors of the Iranian economy should be imposed,” added Hoenlein and Greenberg. “We hope that our European Allies will join in this endeavor. More effective compliance measures without sunset clauses, and giving inspectors unfettered access to military and other barred sites, should be included. The threat that Iran poses to Israel, its neighbors, and the world at large, mandates a comprehensive approach," they concluded. The National Conference on Jewish Affairs (NCJA) welcomed Trump’s announcement. “In addition to literally flying hundreds of millions in cash -- U.S. taxpayer dollars -- right to Iran, the Obama Administration unfroze Iranian assets, estimated at $100 billion to $150 billion, enriching the Iranian regime and strengthening Middle East despots and the terrorist organizations the Iranian government supports,” continued the NCJA. ““We thank President Trump for acting with resoluteness and courageous leadership to protect the safety and security of the American People,” concluded the statement.